The XII Football Campus City of Granada has been closed this Friday June 14 at the Municipal Theater of Alhendín after an intense week in which almost a hundred participants have lived unique experiences. Since the Cajasol Foundation we have increased our collaboration this year, providing 40 scholarships for children with social and economic difficulties, all from different centers and associations throughout Andalusia, through the Association 1,000 Causes. It has been a week loaded with sports activities, mainly soccer, accompanied by basketball, volleyball or paddle. There has also been time for training with workshops that have focused on nutrition, injury prevention or control of emotions in the sport, by the hand of Dr. Miguel Angel Gallo and the psychologist Zoraida Rodríguez. Leisure has occupied another very important part in the development of the Campus, with numerous games, gymkhanas, karaokes or dances. 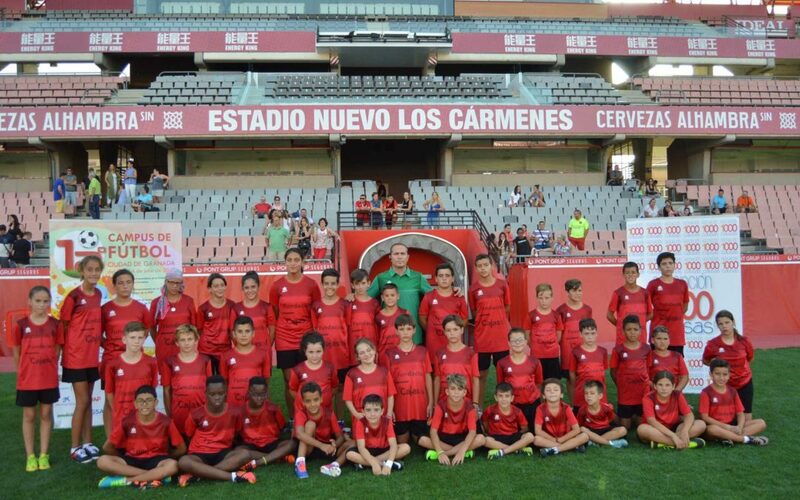 The peak moments of the Campus were held on 11 and 12, with training at the Estadio Nuevo Los Cármenes and, the following day, an unforgettable visit to the City of Football in Las Rozas, where the young participants were able to visit the Museum of The Spanish Football Federation, the costumes of “La Roja” and to carry out a training in the field where our Spanish internationals are regularly practiced. An unforgettable week that will remain in the memory of all participants of the 12th Football Campus City of Granada.